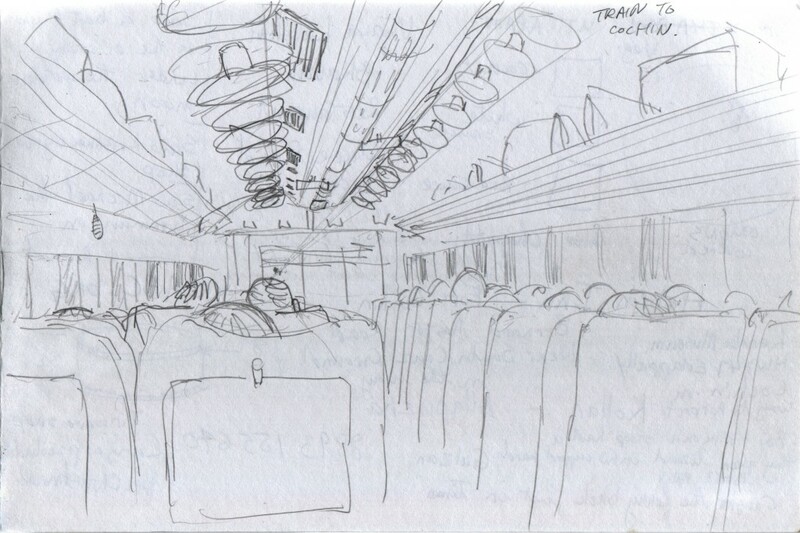 There is a pair of ceiling-mounted fans above each row of seats in the train car. The train cars are voluminous, and the rail gauge is broad (5 foot 6 inches in India compared to 4 foot 8 1/2 inches in Canada). Food service staff walked along the aisles, so it was not necessary to go to a dining car. 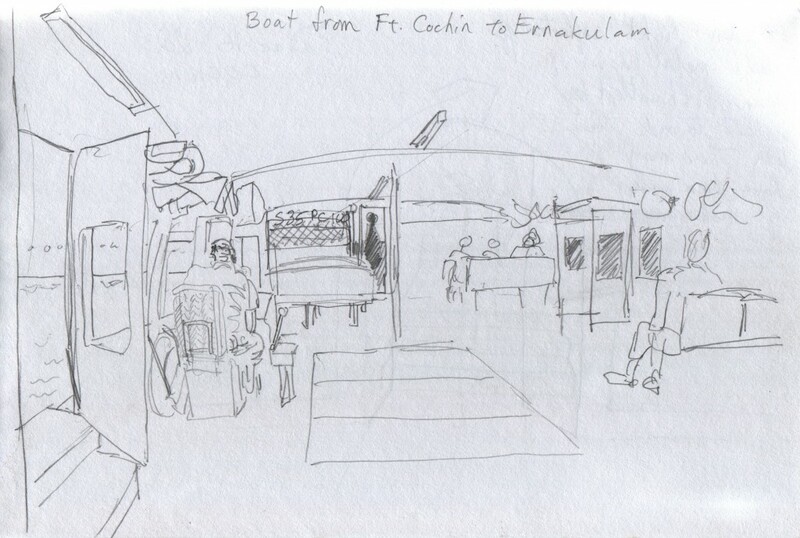 Cochin is part of a metropolitan district that includes Ernakulam, the actual destination where I disembarked. Ernakulam, the business metropolis, and Fort Cochin, the old quarter, sit across from each other, separated by extensive waterways containing harbours and islands. Though Fort Cochin is on the tip of a peninsula that has a roundabout land connection to mainland Ernakulam, boats shuttle the many foot passengers who want to make the trip directly. Cyclists are allowed to take their bicycles along on the ride, space permitting. I did so, and saw others doing so as well. I found that the boat crossing made for a pleasant interlude, day or night, with views of the harbour, islands, buildings, and water. 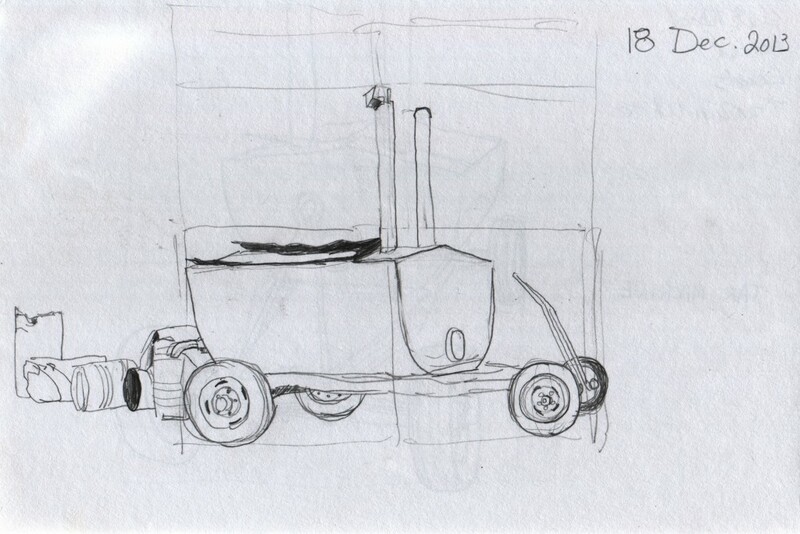 The big six-cylinder diesel engine animated the trip with its steady beat, or its rising and falling revs as the ship’s engineer adroitly helped guide us toward the jetty. On my first day in Ernakulam, my curiosity drove me to immediately take the boat to Fort Cochin. Walking after dark down to the old spice trading district, I passed a doorway in an old building. The door was ajar, and I recalled, silhouetted against distant light were large shiny metal basins and sacks. I saw a person, outlined against the light, walk through the interior darkness. This quiet evening scene made an impression on me, and I attempted to sketch it from memory. Trailer for melting tar for building and repairing roads. In contrast, in Vancouver, Canada, when I see a similar trailer in front of a building, it always means that someone is installing or repairing a roof. Same process, different application. Tar machine, side view, south of Ernakulam. 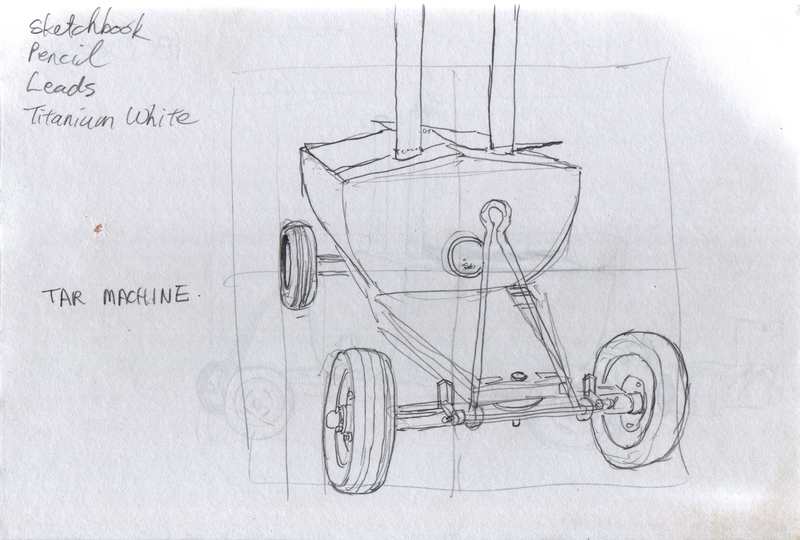 Tar machine for road work. This trailer has a hopper for melting tar for surfacing roads with asphalt. I asked, and apparently these machines are only used for road work. I recall the Canadian version, which is never used for roads, but only for melting tar for tar and gravel roofs. 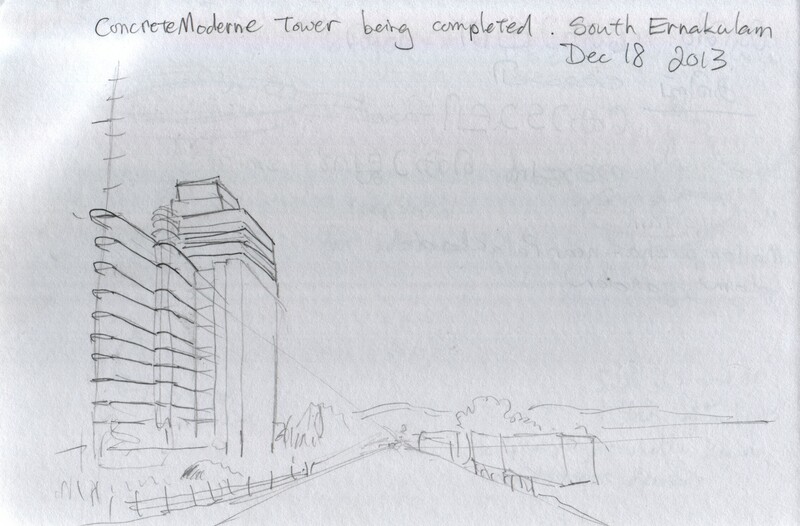 Concrete moderne tower nearing completion, south of Ernakulam. The narrow floor slabs extending out the west side have rounded corners, giving the building the appearance of fitness for motion, like a cruise ship or a locomotive. I thought the design to be reminiscent of the style that we associate with the era in which Raymond Loewy flourished. The southern periphery of Ernakulam is open land, with fields, canals, and small buildings. This residential tower, standing tall in the countryside, marks a change in the area. I passed by this building when I rode my bicycle to visit HIll Palace Museum in Thripunithura. I later sketched it from memory. 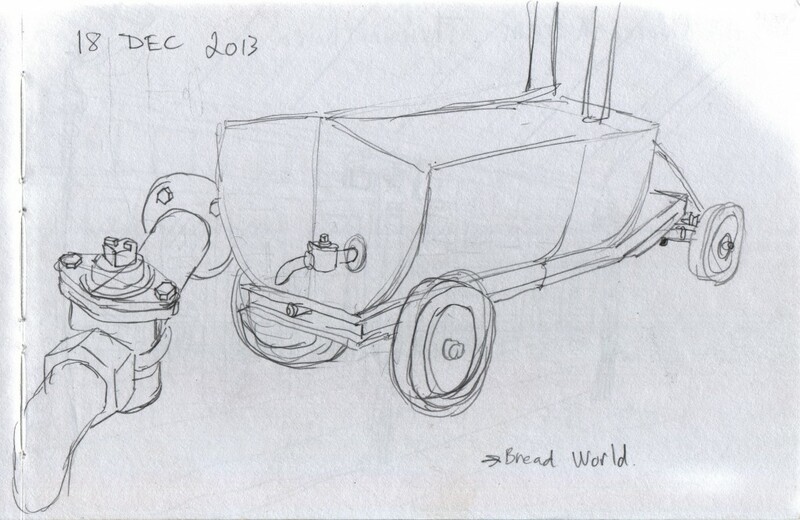 By the roadside and at storefront stands I often saw sugar cane presses. When a customer wants juice, the vendor feeds a fresh stick of sugar cane through the press and gathers the juice in a pot. The vendor pours the juice through a strainer into the glass. Often a single cylinder diesel engine, similar to the engine in an autorickshaw, powers the press via a belt drive. 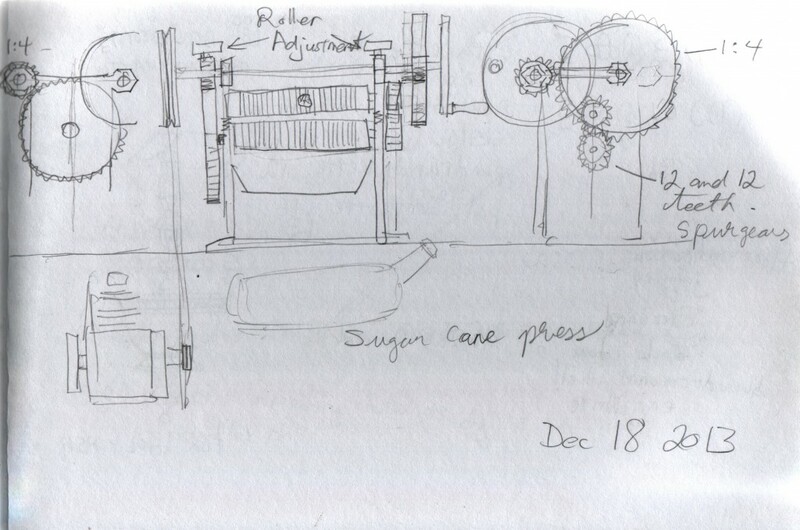 I made other attempts to sketch such a press. 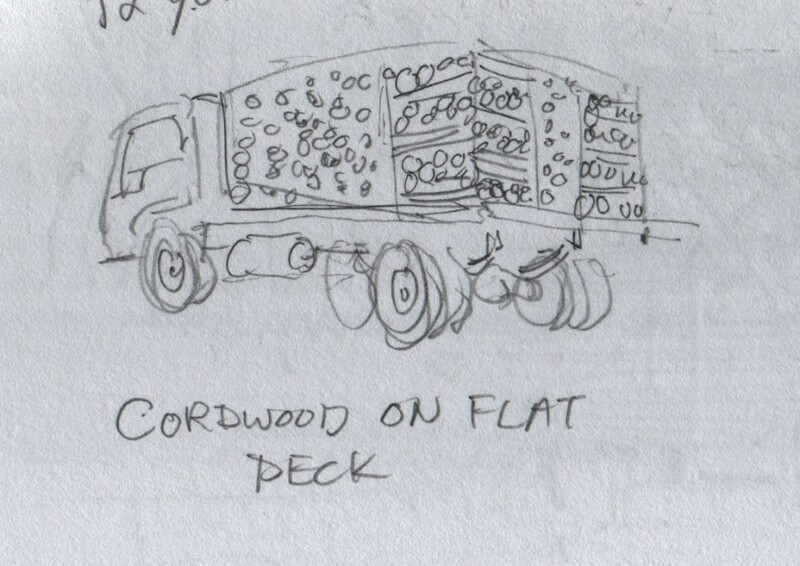 This truck carries logs. The people cross-piled the logs on the corners to stabilize the load. Ropes hold the load to the bed. This truck carries over 100 oil barrels. The barrels are stacked five layers deep in rows of ten on each side of the truck bed. More barrels fill the space between the stacks of barrels. Ropes hold the barrels in place. I passed near the Vyapar Bhavan Building in Ernakulam on my frequent trips to Hill Palace Museum. The façade has columns on the overhanging upper storeys, supported on two massive columns that transmit the load to the ground. This is a conical clutch element. 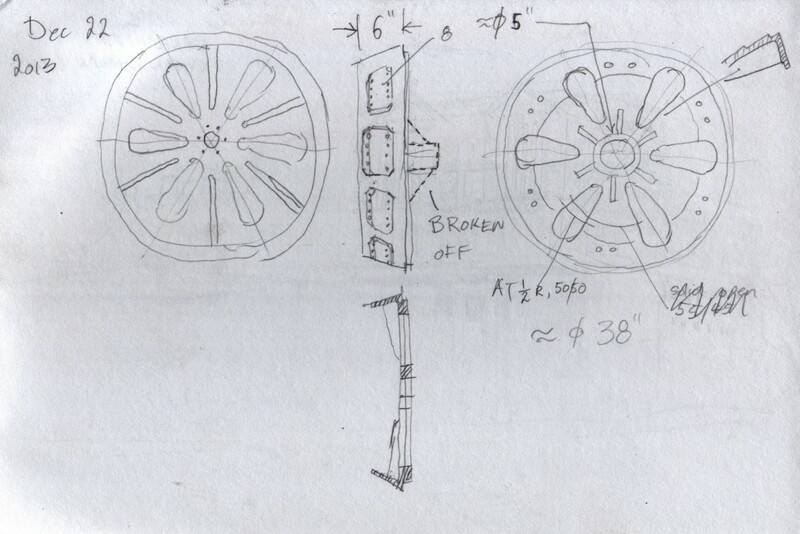 It is a cast iron wheel with a tapered rim, upon which are fastened patches of friction material, likely asbestos. I estimated the diameter at 38 inches. I do not know from what giant machine this clutch element came. I saw this cast iron item by the side of the road on one of my bicycle rides from Ernakulam to the Hill Palace Museum. 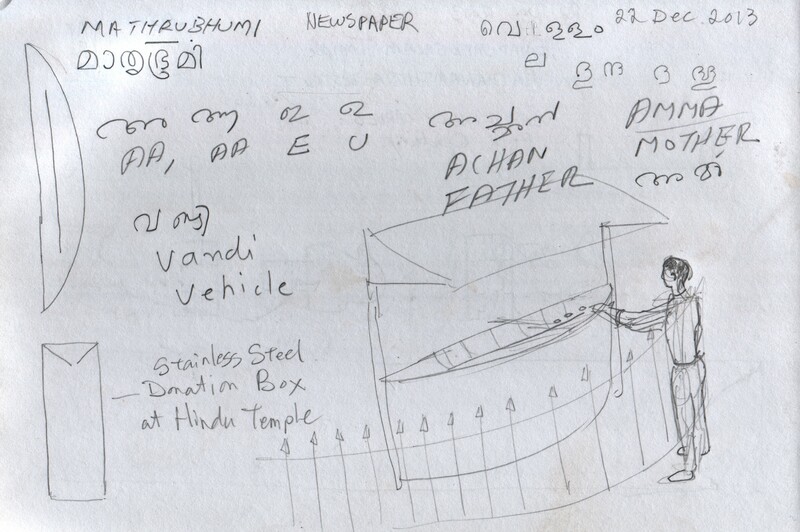 This temple donation box in Ernakulam was nicely designed, I thought. The donation box is a tall, almost boat-shaped container made from stainless steel. The shape nestles into the curve of the fence, and a canopy keeps rain out of the funnel-shaped top. Valanjambalam Devi Temple is in Ernakulam on the corner where Chittoor Road meets SA Road. 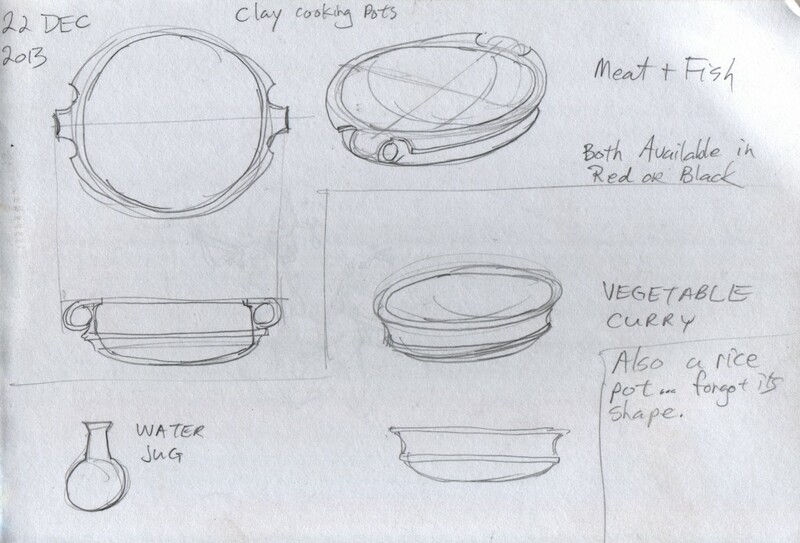 These are traditional shapes for cooking pots in Kerala. Different shapes denote different uses. The pots can be metal or ceramic. Roadside vendors displayed stacks of these ceramic pots. The pot colour was either a vivid earthen red, or black. The ceramic water jug is renowned for keeping water cool without refrigeration. From the descriptions that people gave me, I surmise that the clay’s slight porosity allows a small amount of water to very slowly seep through and cool the jug by evaporation. I like the forms of the pots. I would gladly have bought a couple to take home, save for the fact that I was setting out on a cycle tour and their fragility and large size would have required more special precautions than I was ready to do to ship them safely home. 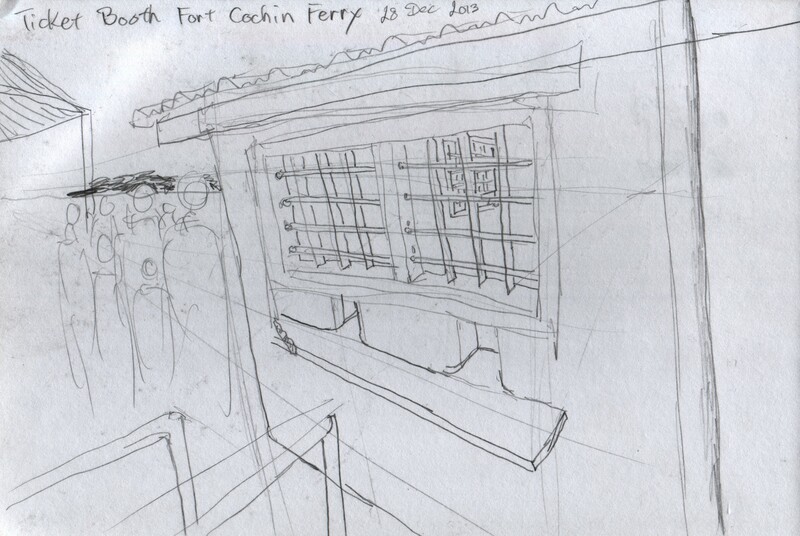 This is the stone building that is the ticket booth for the ferry in Fort Cochin. 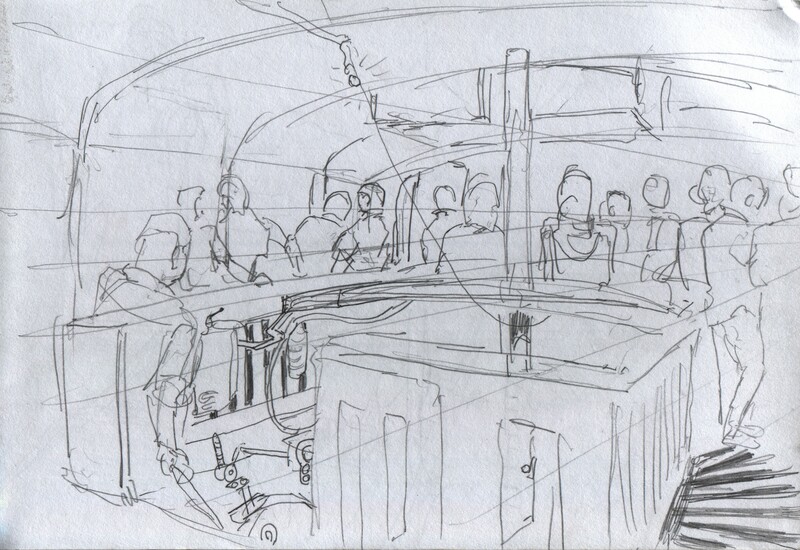 A man works behind the grille, selling tickets to two lines of passengers, one line up of women and one line up of men. The passenger ferries that shuttle back and forth between Fort Cochin and Ernakulam are a mainstay of public transportation. The Kerala State Water Transport Department operates the ferries. This stone building on Fort Cochin’s waterfront is the ticket booth for the ferry. A man works behind the grille, selling tickets to two lines of passengers, one line-up for women and one line-up for men. 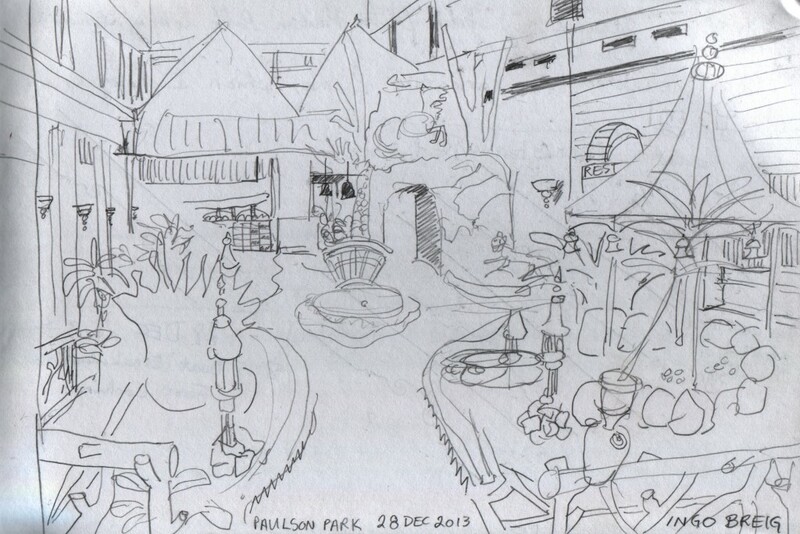 The atrium at Paulson Park Hotel contains a fantasy garden, or an indoor park. A horse rears up in profile atop a miniature mountain. A short tunnel walkway goes through the mountain. A bridge, a pond, a gazebo, fanciful trees, and a meandering path provide entertainment for visiting children. I enjoyed seeing the park, too. The hotel itself rises in several storeys around the atrium, and a roof that appears to have been added later caps it off. The earlier version of the hotel is a popular design, with a courtyard instead of a covered atrium. These sketches are attempts to remember the ornate embellishments carved into the roof joists in a traditional home that I had the honour of visiting. The house is an ettukettu, or two-courtyard house, that is centuries-old. 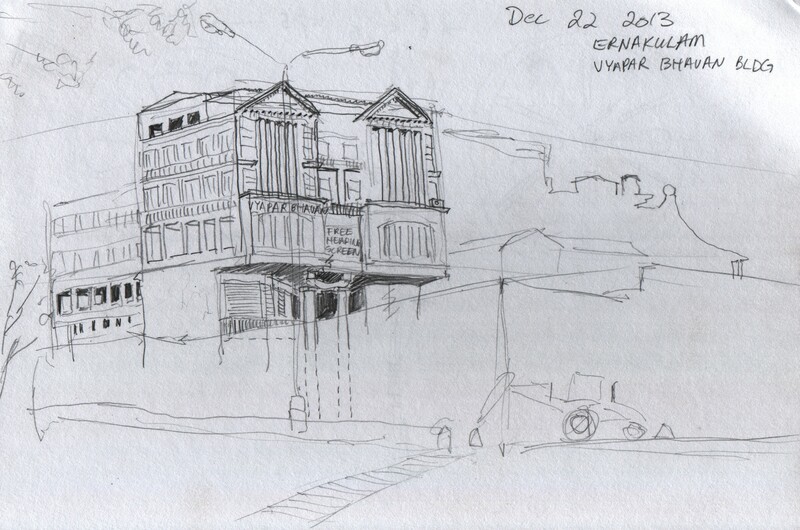 A gentleman was kind enough to show me his rural home neighborhood in Piravom. This is the engine well in one of the wooden passenger ferries that serve Fort Cochin and Ernakulam. The ship’s captain sends signals via a string and a bell to the engineer, who works directly beside the big Ashok Leyland six-cylinder diesel engine. The engineer moves with the smooth expertise of a master of his profession, shifting the gearbox and operating the throttle. In conjunction with the helmsman, the two of them guide the big boats across the bays and dock them precisely to the jetties. 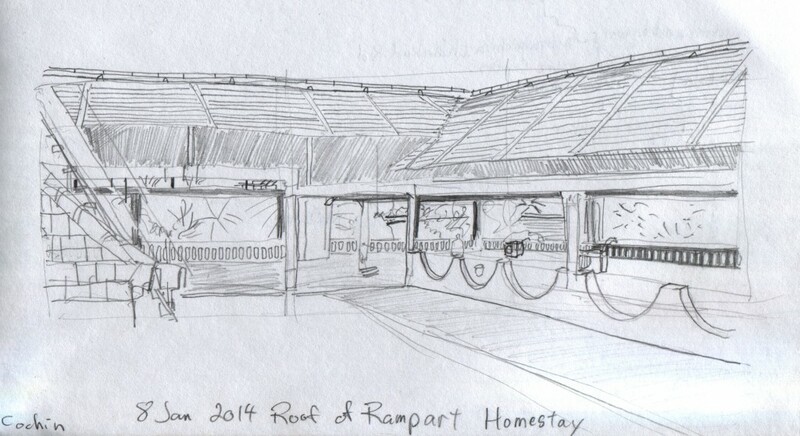 Rampart Homestay is a small, modern, multi-storey residence that gives a pleasant view over a residential area in Fort Cochin. From the balcony I was able to see fowl in a neighbouring yard, plus houses and lanes stretching off into the greenery. This sheltered terrace is on the roof of the second homestay where I resided in Fort Cochin. 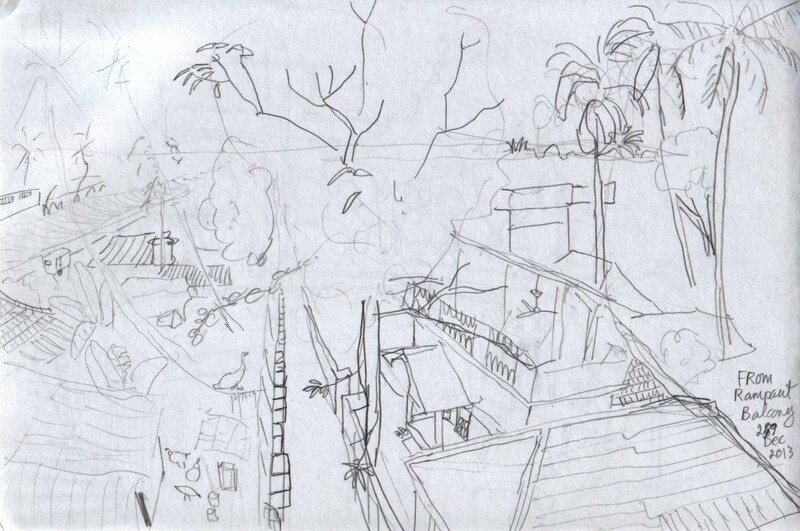 Though it was off limits, I sat outside the fence on the stairs and sketched it. I did not see anyone use the patio. This easy chair comes in folding and non-folding variants. The long armrests also serve as leg rests, allowing the sitter to put one or both feet up on the ends. A common name is “grandfather chair”. The Malayalam name for this chair is ചാരുകസെര (charukasera). 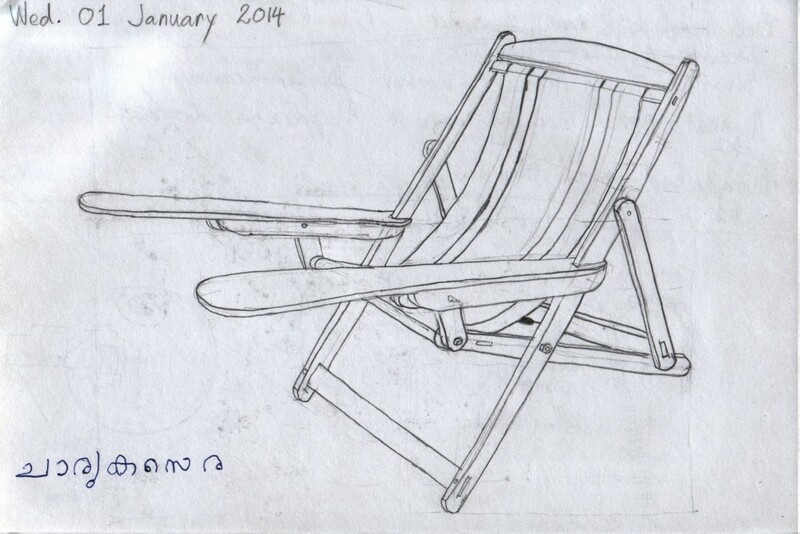 I was delighted to be able to use such a chair during my time at Rampart Homestay in Fort Cochin. This Rajasthani bullock cart was on display in an antique dealer’s courtyard. The cart looks entirely hand-made. The heavy timbers are curved. A post near the end of the draw bar acts as a leg to keep the cart level when it is parked. Bands of hammered sheets of metal with impressed geometric patterns encircle the draw bar. Iron fittings on the edge of the deck protect the frame timbers with caps and provide rings and hooks as attachment points for rope. The decorations must have made the cart look magnificent when it was new. The spice trading district in east Fort Cochin has numerous antique and curio shops. This cart, and another like it, were in one of the largest shops. The shop spans several adjacent buildings, some as large as warehouses, and includes a patio cafe that fronts on the harbour. In keeping with the scale of the premises, the merchandise for sale included furniture and architectural elements such as columns. I was shown entire rooms and sections of buildings, disassembled in northern Indian states and reassembled in the Fort Cochin showroom. This is the Althara Bhagavathy Temple on Amman Kovil Road, Kochi. 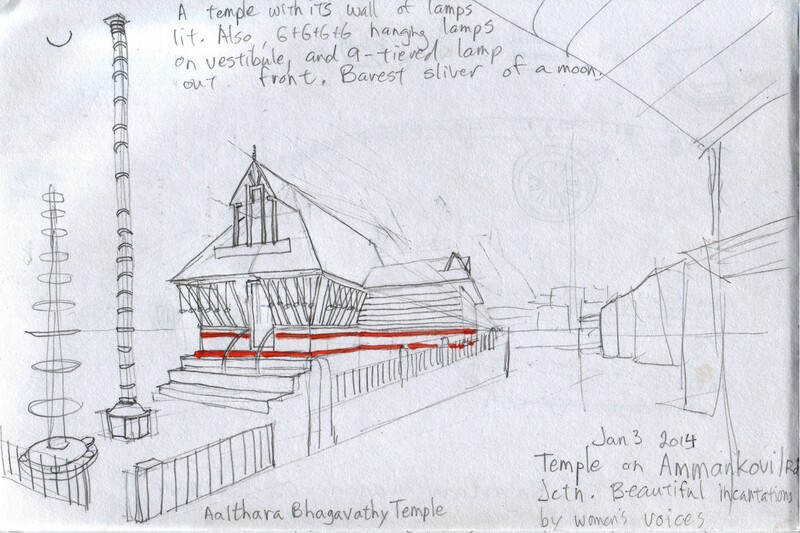 This temple had its exterior walls divided into hundreds of square alcoves. In each alcove lay a small oil lamp that flickered in the gathering darkness at sundown. Lit oil lamps hung on three sides of the entrance porch roof. And finally, the nine-tiered oil lamp in front of the temple was also lit. The view was magnificent. Beautiful incantations by women’s voices drifted out into the street. The barest sliver of the moon hung in the evening sky. A prominent feature of the temple building is the orange painted bands that encircle the foundation wall. I stood under an awning across the street, trying to memorize as much of the scene as possible, and enjoying it while I was there. I thought that I would look too intrusive if I took out my sketchbook right there, jotting down notes while people came and went. 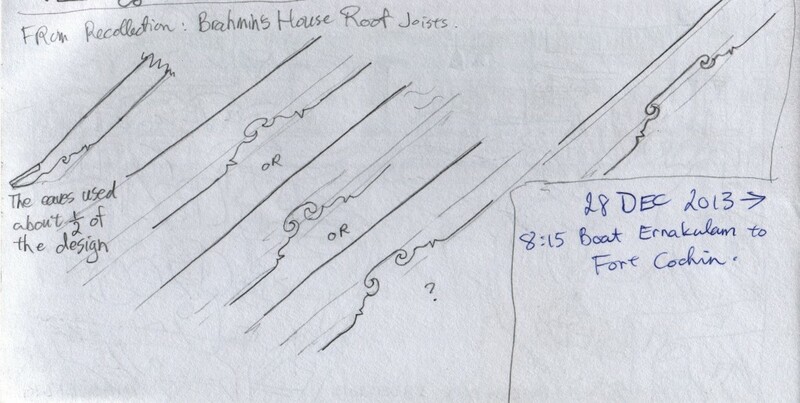 I drew this sketch later from memory. 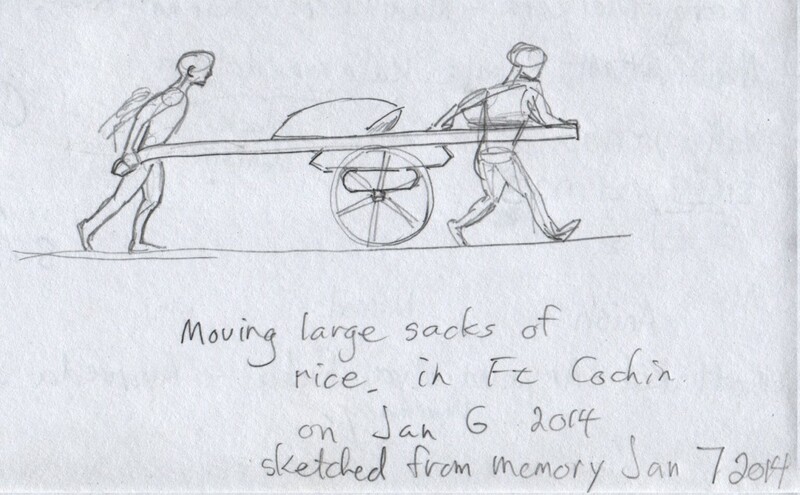 Two men moved a large, heavy sack of rice with a two-wheeled cart. 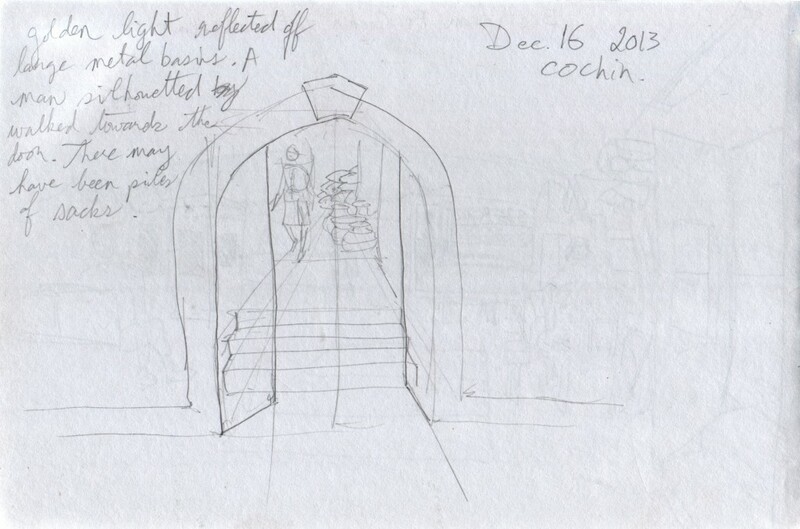 The men chatted with each other as they guided the cart through the streets of Fort Cochin. This seemed like a genial way to get the job done. 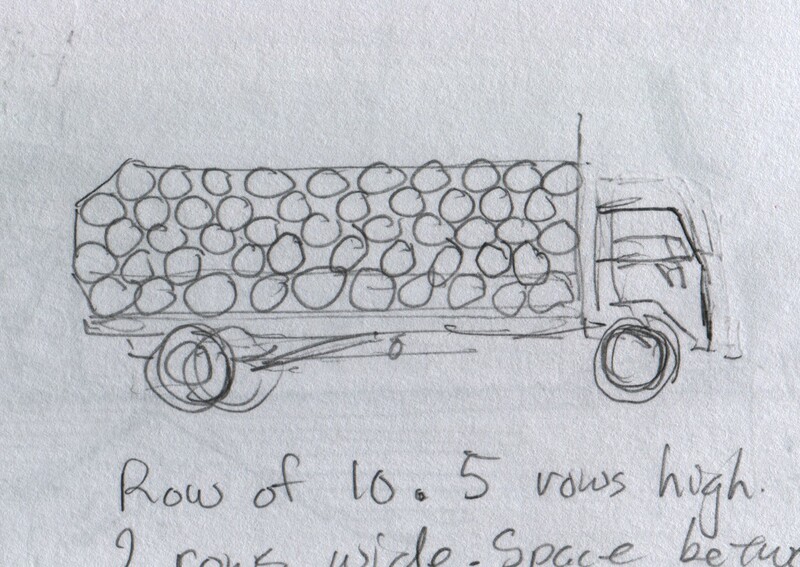 For moving heavy loads short distances, this seems better than a truck for several reasons. 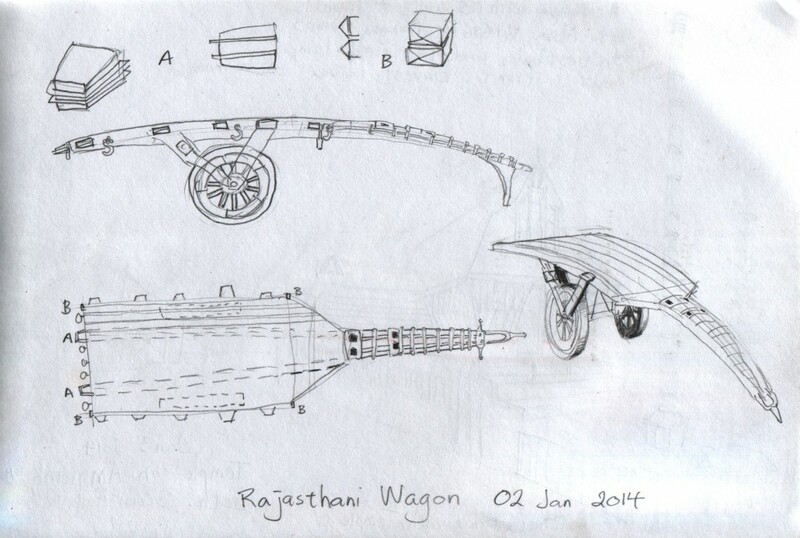 It’s sociable; doesn’t pollute; bystanders don’t have to reckon with a motor vehicle; it’s quiet; takes up very little space compared to a motor vehicle (besides an autorickshaw); has low equipment maintenance costs; vehicle probably doesn’t require insurance; the vehicle requires no fuel of its own; people get exercise that they would not get if driving. There are possibly reasons why someone might not prefer to use such a cart: hard work, for one. As much as motor vehicles disturb the social fabric, this cart seems to be part of the social fabric.